Charlotte Lewis can’t pinpoint exactly when she fell in love with Basset Hounds. The Menlo Park resident, who is completing her high school studies at Canada’s Middle College, has spent most of her life with Toby, a 13-year-old Labrador Retriever, a far more common breed in this area. 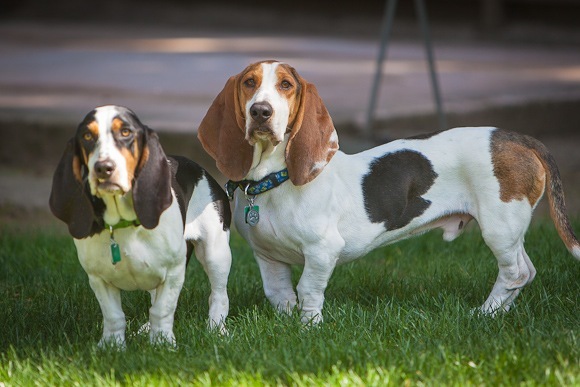 An interest started “two to three years” ago turned into the reality of Basset Hound ownership earlier this year when she started to talk to her Mom about the possibility of rescuing a Basset. “Ideally, I was looking for a young female,” she said. “But, I definitely wanted to rescue. Not surprisingly, Dad needed some convincing. That done, the family headed off to the Southland last month to pick up Molly and Eli (left and right in photo). “Their previous owner was a mother and her young daughter, so they’re both a little wary of men,” said Charlotte. “But, they’re such love bugs. I get stopped whenever I’m out walking them. Some people even pull over in their cars! Basset hounds really do make great pets and rescuing is so rewarding. If she hasn’t joined already, Charlotte should join that Daily Drool mailing list. Its a great resource for quirky basset hound behaviors and medical issues. Plus it is filled with people who love bassets and there us a lit of humor and care among the group.